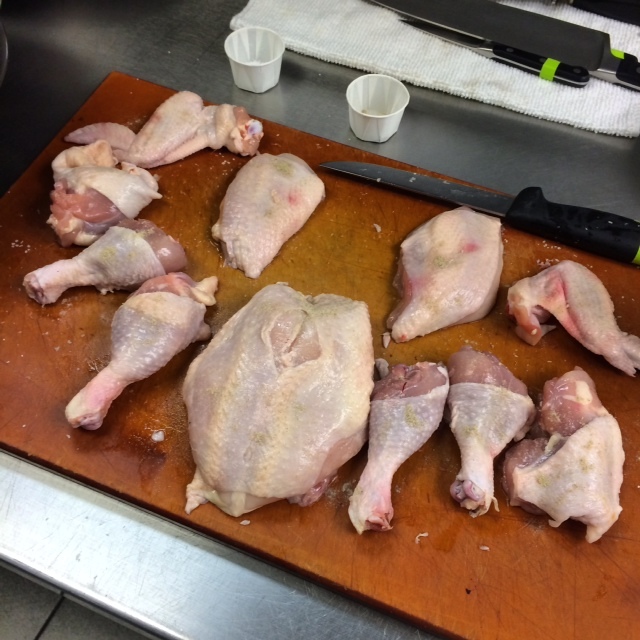 Chef gave me a demo on another chicken and showed me a few tricks on where to cut and pull the joints apart by hand. After the demo, I did another chicken just for extra practice. So I walked out of class with three whole chickens, half of which were pan roasted and baked off in the oven and subsequently became treats for Charlie, the other half went into the freezer uncooked and will go to my sister. She’ll get more use out of them than I will. Another part of the test was being able to cite measurement conversions from memory. I failed miserably on that. I admit to not really spending time memorizing it because I never expected to be quizzed about it. (That’s what Google is for, right?) It was really embarrassing when I couldn’t answer most of the questions as Chef was quizzing me. He was writing something down on a clipboard that I couldn’t see. It was like that episode of Seinfeld where Elaine goes to the doctor and gets all anxious when she can’t see what’s in her file. Guess I better spend some time going back over that stuff! 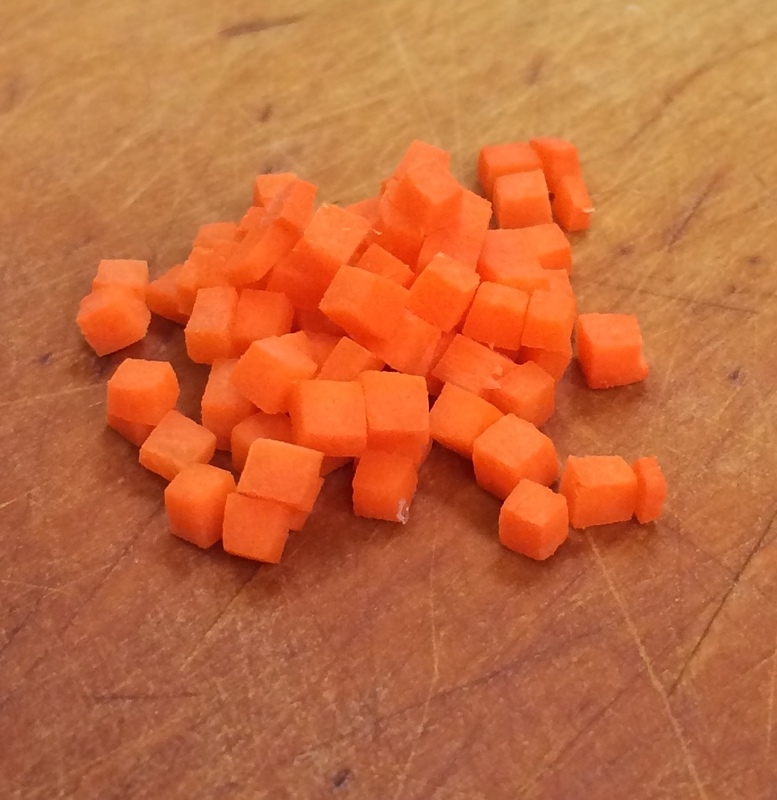 The last part of the test was a knife cut test. 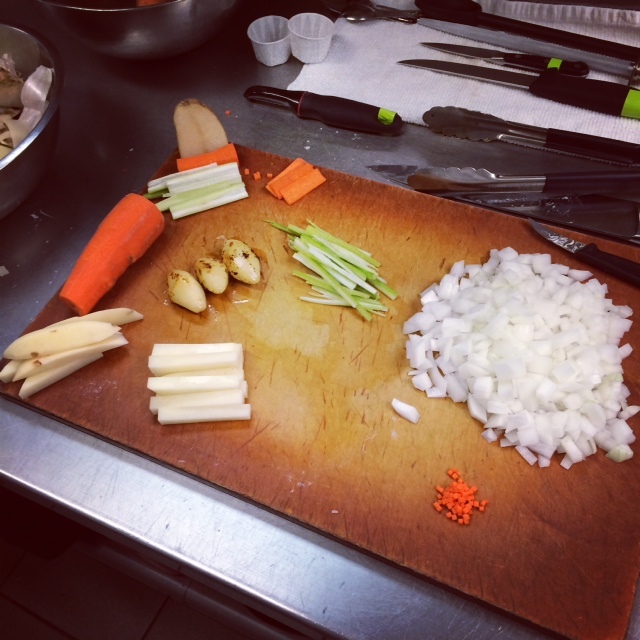 We had to julienne celery, small dice an onion, tournet a potato, brunoise a carrot and make pomme frites. At least I did well enough on that part. Still need a lot of work on my tournet skills, but I got the brunoise thing down pretty good. The past 5 weeks have been so awesome and I’ve had so much fun. I’ve learned a ton of stuff that I can apply right away and I definitely feel like I’m becoming a better cook. I can’t wait for the next 5 weeks!